The B and T lymphocyte attenuator (BTLA) is a recently identified member of the CD28 family of cell receptors. Initial reports demonstrated that mice deficient in BTLA expression were more susceptible to experimental autoimmune encephalomyelitis, indicating that BTLA was likely to function as a negative regulator of T cell activation. 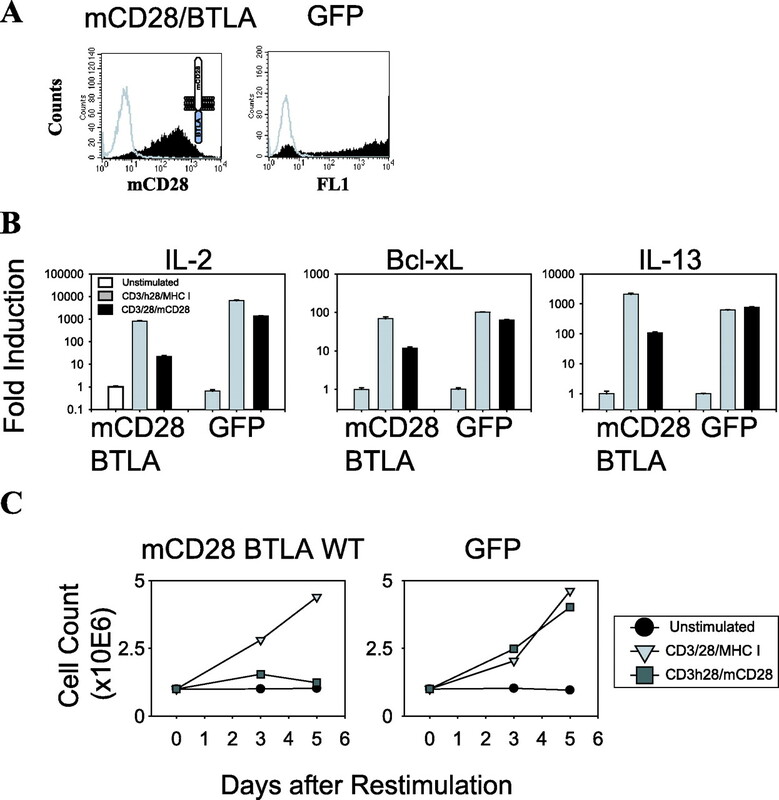 However, cross-linking of BTLA only resulted in a 2-fold reduction of IL-2 production, questioning the potency with which BTLA engagement blocks T cell activation. We established a model in which BTLA signaling could be studied in primary human CD4 T cells. We observed that cross-linking of a chimeric receptor consisting of the murine CD28 extracellular domain and human BTLA cytoplasmic tail potently inhibits IL-2 production and completely suppresses T cell expansion. Mutation of any BTLA tyrosine motifs had no effect on the ability of BTLA to block T cell activation. Only mutation of all four tyrosines rendered the BTLA cytoplasmic tail nonfunctional. We performed structure-function studies to determine which factors recruited to the BTLA cytoplasmic tail correlated with BTLA function. Using pervanadate as a means to phosphorylate the BTLA cytoplasmic tail, we observed both Src homology protein (SHP)-1 and SHP-2 recruitment. However, upon receptor engagement, we observed only SHP-1 recruitment, and mutations that abrogated SHP-1 recruitment did not impair BTLA function. 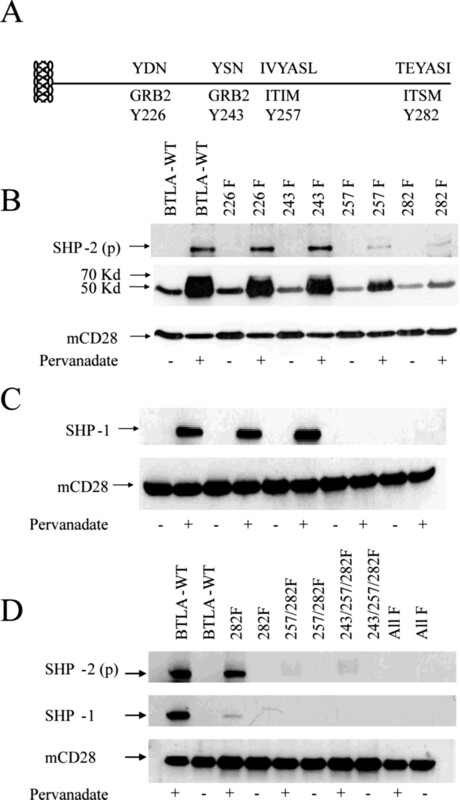 These studies question whether SHP-1 or SHP-2 have any role in BTLA function and caution against the use of pervanadate as means to initiate signal transduction cascades in primary cells. The complexity by which the adaptive immune response is regulated is becoming appreciated as increasing numbers of cell surface receptors that modulate the immune response are identified. The CD28 family of receptors, which currently consists of CD28, ICOS, CTLA-4, programmed death-1 (PD-1),3 and B and T lymphocyte attenuator (BTLA), plays a prominent role in regulating the initiation of an immune response. Ligation of either CD28 or ICOS enhances T cell activation, whereas engagement of CTLA-4, PD-1, or BTLA attenuates the T cell response (1, 2, 3, 4, 5). None of these receptors have enzymatic activity. Rather, receptor engagement leads to phosphorylation of tyrosine residues within the members’ cytoplasmic tails that in turn recruits signaling molecules that start a cascade of signaling events, which ultimately lead to modulation of TCR-generated signals. BTLA is the most recently described member of the CD28 family and it has a number of characteristics that distinguish it from the other members of the CD28 family (6). BTLA was discovered as an unidentified expressed sequence tag overexpressed in murine Th1-differentiated cells compared with Th2-differentiated cells (7). Interestingly, others independently identified BTLA as a transcript highly up-regulated in PMA- and ionomycin-treated thymocytes (8). Mice deficient for BTLA expression express higher levels of serum Ig after immunization with nitrophenol-conjugated keyhole limpet hemocyanin. Moreover, BTLA-deficient mice displayed a higher susceptibility to experimental autoimmune encephalomyelitis and loss of BTLA-accelerated, partially MHC-mismatched cardiac allograft rejection (9). Along with this in vivo evidence indicating that BTLA was a negative regulator of T cell activation, in vitro studies revealed that BTLA engagement of anti-CD3-stimulated DO11.10 hybridoma T cells resulted in only a 2-fold reduction of IL-2 production, questioning how potent this receptor is compared with other inhibitory receptors in blocking cell activation (10). Initial reports indicated that BTLA bound the B7x (B7-H4, B7S1), as a B7x-Fc fusion protein did not bind BTLA-deficient T cells (10, 11). However, further characterization revealed that the TNF family member herpes virus entry mediator (HVEM) uniquely bound BTLA, providing the first example of a TNF family costimulatory ligand binding a member of the CD28 family (12, 13). Like PD-1, BTLA is expressed in both B and T cells and is located on a different chromosome than CD28 (10). Further similarities between PD-1 and BTLA are revealed on examination of the phosphotyrosine motifs within their cytoplasmic tails. Both receptors contain a membrane proximal ITIM and membrane distal immunoreceptor tyrosine-based switch motif (ITSM), which are separated by a 19-aa spacer region. ITIMs are found in many immune receptors that inhibit immune cell activation (14). This I/V/S/LxYxxL/V sequence can recruit Src homology (SH) protein (SHP)-1, SHP-2, and SHIP phosphatases to the cell membrane and presumably interfere with the initial steps of cell activation (15). The ITSM (TxYxxV/I), originally defined in CD150 (16), recruits SHP-2 to the CD150 cytoplasmic tail. However, in the presence of the small adaptor protein SH2 domain-containing protein D1A (SH2D1A), the ITSM recruits SHIP to CD150, and hence, the ITSM is able to “switch” the molecules it recruits based on the presence or absence of SH2D1A. In contrast to the CD150 ITSM, the PD-1 ITSM appears to be unable to bind SH2D1A or SHIP, suggesting that there is heterogeneity in the mechanism by which ITSM signals (17). A single point mutation (Y248F) in the PD-1 ITSM completely abrogated the ability of PD-1 to recruit SHP-1 and SHP-2 and interfere with T cell activation. Interestingly, mutation of the ITIM in the PD-1 cytoplasmic tail had no detectable effect on the ability of PD-1 to mediate suppression of cell activation (17, 18). This finding suggests, but does not prove, that the critical signaling molecules that mediate PD-1 immunosuppressive functions are solely recruited to ITSM. In contrast to PD-1, other receptors such as platelet-derived growth factor require multiple phosphotyrosine motifs to recruit SHP proteins to the cytoplasmic tail of cell surface receptors (19, 20). Using Jurkat T cells it was recently demonstrated that disruption of either the ITIM or ITSM abrogated the ability of BTLA to recruit either SHP-1 or SHP-2 (21), suggesting BTLA recruits SHP-1 and SHP-2 in a manner distinct from PD-1 and both tyrosine motifs are required to block T cell activation. In addition to ITIM and ITSM, the human BTLA (hBTLA) cytoplasmic tail also contains two Grb2/Grb2-related adaptor protein (Grap) binding sites (YXN). Grb2/Grap are adaptor molecules with binding sites that have been reported in a few other receptors that contain ITIM and ITSM (22, 23, 24), but the functional significance of this site has not been clearly defined. Recently, a Grb2/Grap site within the FcRIIβ cytoplasmic tail was shown to cooperate with the ITIM to recruit SHIP, suggesting that the adapter function of Grb2/Grap can be used to recruit both negative and positive regulators of cell activation. However, mutation of the single Grb2 binding site present in the murine BTLA cytoplasmic tail had no effect on the ability of BTLA to recruit SHP-1 and SHP-2, leaving the role of Grb2 binding site within the BTLA cytoplasmic tail undefined. In this study we performed a structure-function analysis of the BTLA cytoplasmic tail in primary human T cells. Our results differ considerably from those obtained in murine DO11.10 (10) and human Jurkat (21) cell lines. Using a model in which function could be correlated with factor recruitment, we failed to detect SHP-2 binding, and SHP-1 binding did not correlate with BTLA function. Our results emphasize the need to develop primary cell signal transduction models in which function can be correlated to structure. PBLs were isolated from healthy volunteer donors following apheresis and elutriation under a protocol approved by University of Pennsylvania Institutional Review Board. CD4 T cells were purified by negative selection using either magnetic beads (Dynal Biotech) as previously described (25) or RosetteSep columns (StemCell Technologies) as recommended by the manufacturer. These cells were routinely >95% CD3+, >95% CD28+, and <5% CD8+ as determined by flow cytometry. Primary human CD4 T cells were cultured in RPMI 1640 supplemented with 10% FCS, glutamine and antibiotics (Invitrogen Life Technologies). CD4 T cells were stimulated with artificial APCs comprised of magnetic beads (Dynal Biotech) at a ratio of 1:3 (cells to beads) coated with the following Abs: anti-CD3 (OKT3; Orthoclone), anti-human CD28 (hCD28, 9.3) (26), anti-murine CD28 (mCD28, 37.51; BD Biosciences), and anti-MHC class I (W6/32; American Type Culture Collection). For all experiments these artificial APCs were coated with suboptimal anti-CD3 Ab (5%), suboptimal levels of anti-CD28 Ab (10%), and either anti-MHC class I Ab (CD3/h28/MHC-I) or murine CD28 (CD3/h28/mCD28) constituting the remaining 85% of protein added to the bead as previously described (27). The mCD28 extracellular and transmembrane domains, bases 9–539 of NM_007642, were amplified from a mCD28 encoding plasmid (provided by Dr. K. Lee, University of Miami, Miami, FL) using PCR, ligated to a PCR product containing bases 715-1041 of BTLA (NM_181780) obtained from primary human T cell cDNA and placed into the pCLPS lentiviral expression vector (28). Tyrosines to phenylalanine mutations within mCD28/hBTLA were produced as previously described by Wang and Wilkinson (29). To generate the monomeric form of BTLA, we mutated the most membrane proximal cysteine of mCD28 extracellular domain to alanine. DNA sequencing was used to confirm the fidelity of all constructs. High-titer lentiviral vectors were produced as previously described (28). Lentiviral vectors were transduced into CD4 T cells by first activating 2 million CD4 T cells with CD3/hCD28 coated beads for 24 h. From 300 to 500 μl (∼5 × 107–5 × 108 IFU) of vector was incubated with the activated CD4 T cells and centrifuged at 1200 × g for 2 h (30). The following day the medium was exchanged and the cells were expanded until they returned to near resting cell volume as measured by a Beckman Coulter Counter Multisizer II. For pervanadate treatment primary human CD4 T cells (15 million cells/sample) were washed twice with cold PBS, resuspended in 800 μl of PBS and incubated at 37°C for 30 min. Pervanadate was prepared using 1 mM NaVO4 (mixed 1:1 with 17 μl of hydrogen peroxide added to 5 ml of PBS). A total of 200 μl of the H2O2/NaVO4 mixture were added to the CD4+ T cells and incubated for 5 min. Cells were lysed in 500 μl of 1% Nonidet P-40 lysis buffer (31) for 20 min at 4°C and pelleted for 10 min at 14,000 rpm at 4°C. To detect BTLA phosphorylation and recruitment of SHP-2 and SHP-1, the cell lysate was immunoprecipitated overnight with 4 μg of anti-mCD28 (37.51). Protein G-Sepharose was added to the immunoprecipitates, incubated at 4°C for 1.5 h, and washed five times with 1% Nonidet P-40 lysis buffer. Lysates were resolved by SDS-PAGE and transferred to nitrocellulose. Blots were probed with appropriate primary and secondary Ab combinations and proteins were visualized using an ECL+ kit (Amersham Biosciences). The following Abs were used: anti-phosphotyrosine (4G10) Ab (Upstate Biotechnology); anti-SHP-1 (sc-287) and anti-SHP-2 (sc-280) Ab (Santa Cruz Biotechnology); goat anti-mouse CD28 polyclonal Ab (R&D Systems); anti-mouse IgG-HRP (Amersham Biosciences); and anti-rabbit IgG-HRP and anti-hamster IgG-HRP (Southern Biotechnology Associates). To detect the mCD28/BTLA dimer and monomer constructs, whole cell lysates were resolved by SDS-PAGE under reducing and nonreducing conditions and transferred to nitrocellulose. The blot was probed with a polyclonal Ab against mCD28 (R&D Systems). For artificial APC immunoprecipitation assays primary human CD4 T cells were transduced with mCD28/hBTLA-WT and mutant cytoplasmic tail lentiviral vectors. Cells were then expanded with CD3/CD28-coated beads and these beads were removed on day 8. Once the cells returned to a near resting cell volume, they were restimulated with CD3/hCD28/MHC-I- or CD3/hCD28/mCD28-coated beads for 7 min. Cell and bead complexes were then lysed in 5 ml of 1% Nonidet P-40 lysis buffer. Lysates were incubated overnight at 4°C with rotation. Beads and immunoprecipitated complexes were washed five times with 1% Nonidet P-40 lysis buffer using a magnet and resuspended in sample buffer. Immunoblotting was performed as earlier described. For the SH2D1A immunoprecipitation studies, 293T cells were maintained in RPMI 1640 supplemented with 10% FCS, glutamine and antibiotics. For transfection, 1 million cells were plated in 6-cm tissue culture dishes and allowed to adhere overnight at 37°C in 5% CO2. Cells were transfected with a total of 3–4 μg of DNA per plate using Fugene 6 (Roche) according to manufacturer’s protocols. After 48 h, cells were stimulated with pervanadate, and lysates were prepared. 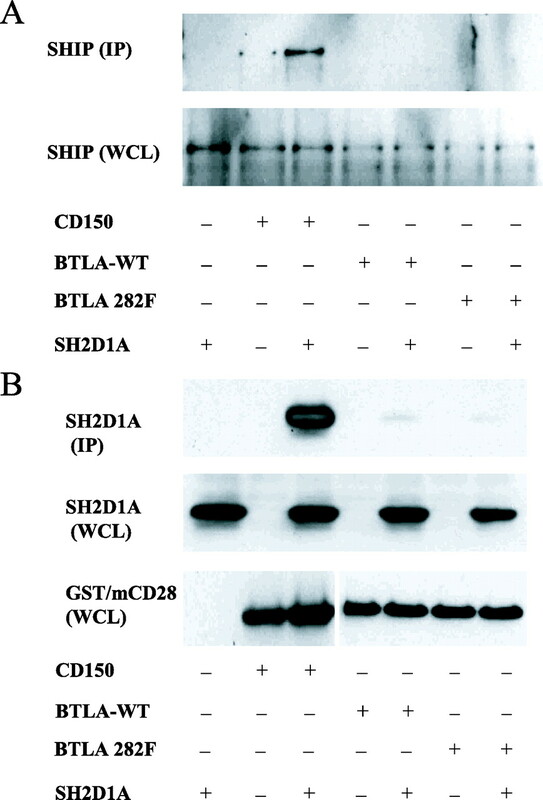 The physical association between mCD28/hBTLA and SH2D1A was investigated by immunoprecipitation and Western blot analysis as described earlier. Interaction of the GST-CD150 cytoplasmic tail and SH2D1A was determined by precipitation of immune complexes using glutathione-coupled agarose beads, followed by Western blotting, as previously described (16, 32). The constructs used for these investigations included mCD28/hBTLA, mCD28/hBTLA 282F previously described, CD150 GST fusion construct, and SH2D1A expression construct obtained from J. Lewis (Metabolism Branch, National Cancer Institute, Bethesda, MD) (33) and pcDNA 3.1 SHIP (a gift from M. Coggeshall, Oklahoma Medical Research Foundation, Oklahoma City, OK). Abs included anti-human SHIP (sc-6244; Santa Cruz Biotechnology), anti-GST (Santa Cruz Biotechnology), anti-mCD28, anti-human SH2D1A, anti-rabbit IgG-HRP, and anti-hamster IgG-HRP (Southern Biotechnology Associates). RNA was purified and reverse transcribed as previously described (25). Primers and probes to detect IL-2, IL-13, Bcl-xL, and 28 S ribosomal RNA were designed using Primer Express software (Applied Biosystems) and are available upon request. Real-time PCR amplification and product detection was performed using the ABI Prism 7700 (Applied Biosystems) as recommended by the manufacturer. A duplicate cDNA reaction was set up in which reverse transcriptase was left out to confirm the absence of genomic DNA. Results were normalized to 28 S RNA levels and relative expression was determined using the ΔΔCT cycle threshold method as recommended by the manufacturer. Results reflect one experiment of three independent experiments performed and with errors for SD. To examine BTLA signaling in primary human CD4 T cells, we established a model by which the effects of BTLA ligation could be observed. We created a chimeric receptor consisting of the mCD28 extracellular and transmembrane region and the intracellular domain of hBTLA (Fig. 1⇓A, inset). The chimeric molecule allows us to specifically trigger the introduced molecule by using Ab specific for mCD28. Previously, we used a similar design (mCD28/hICOS, mCD28/hCD28, and mCD28/PD-1) to perform structure-function studies of the CD28, ICOS, and PD-1 cytoplasmic tails in primary human T cells and found that these chimeric receptors were faithful models of endogenous CD28 family members (17, 28). Ligation of the mCD28/hBTLA chimeric receptor inhibits T cell activation. A, CD4 T cells were transduced with mCD28/hBTLA or GFP expressing lentiviral vectors. Expression of the constructs was determined by flow cytometry 3 days after transduction. B, mCD28/hBTLA or GFP-transduced CD4+ T cells were restimulated with the indicated beads for 24 h, and the indicated transcripts were measured by quantitative RT-PCR. C, mCD28/hBTLA or GFP-transduced CD4+ T cells were restimulated with the indicated magnetic beads, and T cell expansion was measured by cell counting. All data are representative of three independent experiments. 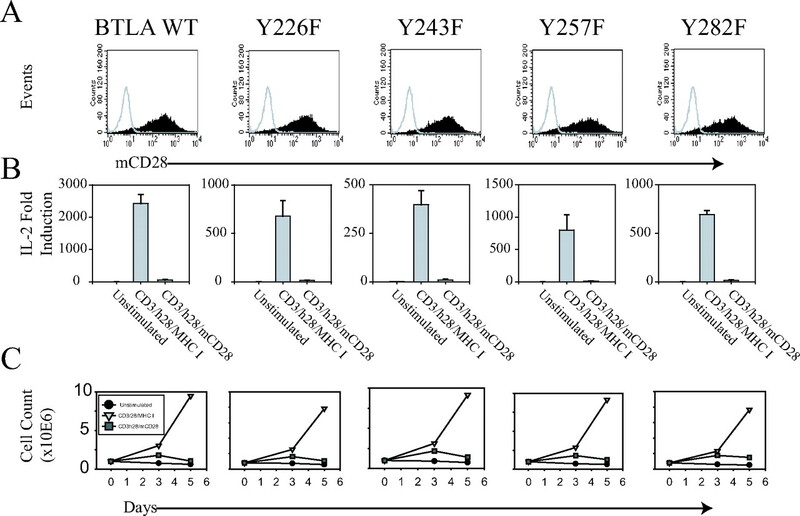 To determine whether the mCD28/hBTLA construct could inhibit T cell activation, we stimulated and transduced freshly isolated primary CD4 T cells with either a lentiviral vector encoding the mCD28/hBTLA-WT receptor or GFP. After 3 days of culture, we observed 95% transduction efficiency of the mCD28/hBTLA construct (Fig. 1⇑A). Next, we restimulated the cells with magnetic beads coated with suboptimal levels of anti-CD3 Ab, suboptimal amounts of anti-CD28 Ab, and MHC class I Ab (CD3/h28/MHC-I) or beads coated with suboptimal levels of anti-CD3 Ab, suboptimal levels of anti-CD28 Ab, and anti-mCD28 Ab (CD3/h28/mCD28). Anti-MHC class I Abs were used as a control because they bind to the T cell surface but do not initiate signals that alter the T cell transcriptional profile (34). After 24 h of stimulation, we measured the induction of IL-2, IL-13, and Bcl-xL expression by quantitative RT-PCR. 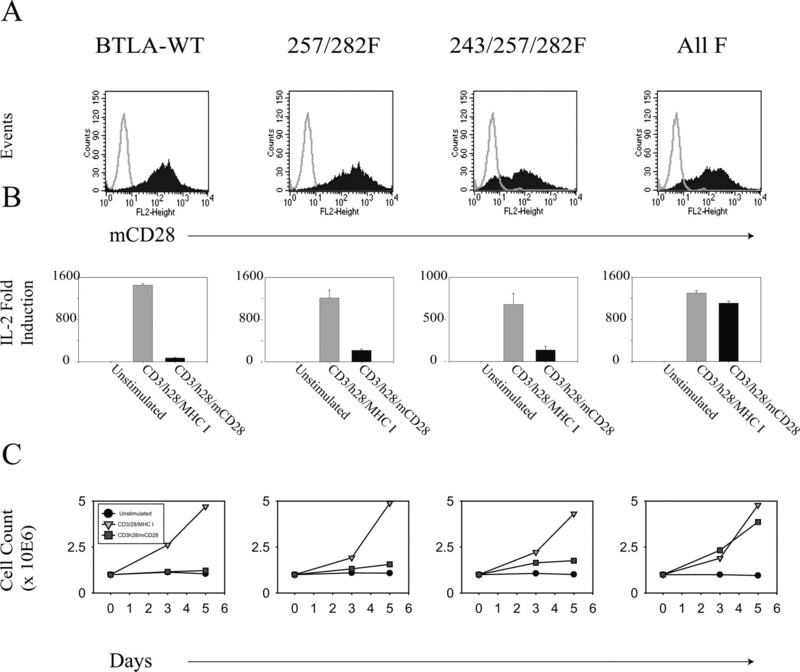 In comparing mCD28/BTLA-transduced cells stimulated with CD3/h28/mCD28 or CD3/h28/MHC-I artificial APCs, we observed greatly reduced up-regulation of IL-2 (∼40-fold), IL-13 (∼20-fold), and Bcl-xL (∼7-fold). In contrast, we observed only small differences in the levels of IL-2 (4-fold), IL-13 (0.8-fold), and Bcl-xL (1.5-fold) produced after GFP-transduced cells were stimulated with CD3/h28/mCD28 or CD3/h28/MHC-I artificial APCs (Fig. 1⇑B). These differences are likely the result of differences in the ability of anti-human MHC class I and anti-mCD28 Ab to bind GFP-transduced cells. Next, we measured the total number of cells that accumulated in the culture after restimulation with the indicated artificial APCs (Fig. 1⇑C). GFP-transduced T cells expanded equally well in response to CD3/h28/mCD28 and CD3/h28/MHC-I artificial APCs, indicating that the mCD28 Ab was not toxic to the T cells. In contrast, cells transduced with mCD28/BTLA failed to expand upon CD3/h28/mCD28 stimulation. These results indicate that BTLA is a potent inhibitor of primary human T cell activation. CD28, ICOS, and CTLA-4 exist as homodimers on the T cell surface. Recently, structural studies demonstrated that PD-1 and BTLA exist as monomers on the T cell surface (35, 36). Interestingly, mouse BTLA is polymorphic for the number of cysteines that exist in its extracellular domain, raising the possibility that BTLA may be monomeric in some strains of mice and dimeric in others (8, 37). We wanted to explore whether BTLA’s ability to block T cell activation was contingent upon it being expressed as a dimer. Based on the structural data showing that the most membrane proximal cysteine was important for CTLA-4 dimerization (38), we constructed a mCD28/hBTLA construct whose most membrane proximal cysteine had been mutated to an alanine. First, we wanted to demonstrate that this mutation converted dimeric mCD28/BTLA to monomeric mCD28/BTLA. Freshly isolated CD4 T cells were transduced with mCD28/hBTLA-WT (dimer), mCD28/hBTLA-WT (monomer), or GFP expressing lentiviral vectors. Whole cell lysates were resolved by SDS-PAGE under reducing and nonreducing conditions. As shown in Fig. 2⇓A, the dimeric form of mCD28/hBTLA runs as a 90-kDa protein under nonreducing conditions and at 45-kDa protein under reducing conditions. The monomeric form of mCD28/hBTLA appears at the 45-kDa protein both under nonreducing and reducing conditions. Next, we wanted to determine whether monomeric mCD28/BTLA could inhibit T cell activation as potently as dimeric mCD28/BTLA (Fig. 1⇑). We stimulated cells transduced with dimeric and monomeric forms of mCD28/hBTLA as well as GFP with CD3/h28/MHC-I-coated or CD3/h28/mCD28-coated beads. As shown in Fig. 2⇓B the monomeric form of the chimeric receptor was as effective as the dimeric in inhibiting the expansion of the T cells. 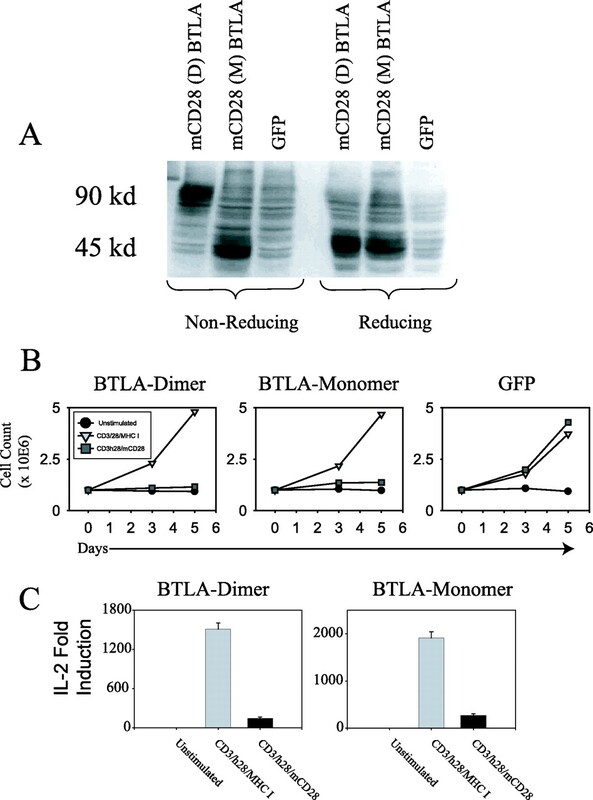 However it cannot be ruled out that upon increasing levels of CD28 costimulation, differences between the ability of the BTLA monomer and dimer to inhibit T cell activation may be observed. We also isolated RNA after 24 h of stimulation and measured the induction of IL-2 by RT-PCR. As shown in Fig. 2⇓C both the dimeric and the monomeric form of mCD28/BTLA potently inhibited IL-2 induction to the same extent. Both monomeric and dimeric forms of mCD28/hBTLA inhibit T cell activation. A, CD4 T cells were transduced with the BTLA-WT chimeric receptor (dimer, D), BTLA-WT (monomer, M), and GFP expressing lentiviral vectors, expanded and rested down. Subsequently, the cells were lysed and the proteins separated by SDS-PAGE. 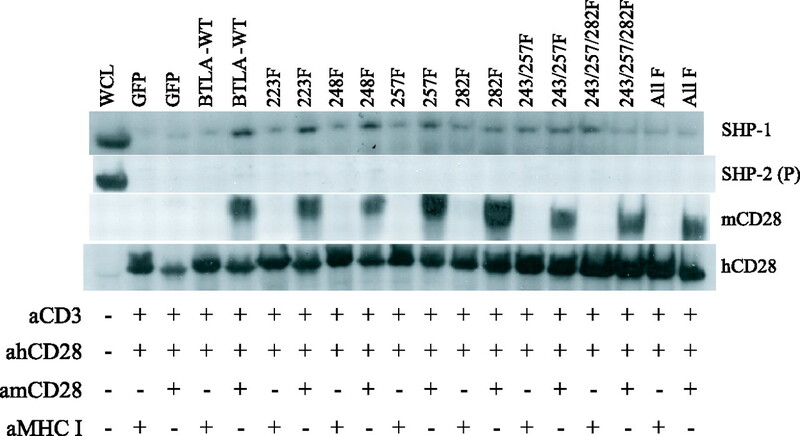 The Western blot was performed under reducing and nonreducing conditions, and the chimeric receptor was detected by probing with a polyclonal mCD28 Ab. B, CD4 T cells were transduced with the BTLA-WT (dimer), BTLA-WT (monomer), and GFP, expanded and rested down. The cells were then restimulated with the indicated magnetic beads, and cell expansion was measured by cell counting. C, Transduced CD4 T cells were restimulated with the indicated artificial APCs for 24 h, and IL-2 expression was measured by RT-PCR and expressed as fold induction over unstimulated cells. All data are representative of three independent experiments. To analyze the structural requirements to recruit signaling complexes to the BTLA cytoplasmic tail in primary human T cells, we constructed a series of BTLA cytoplasmic tail mutants in which the tyrosine in each of the phosphotyrosine domains was mutated to phenylalanine (Fig. 3⇓A). We transduced primary CD4 T cells with each of the single mutants into primary human T cells and treated these cells with pervanadate to induce phosphorylation of the BTLA cytoplasmic tail. These pervanadate-treated cells as well as untreated cells were lysed and immunoprecipitation using mCD28-specific Abs was performed, followed by immunoblotting to identify associated molecules. We probed first for tyrosine phosphorylated proteins using the 4G10 Ab. In cells transduced with mCD28/BTLA-WT we observed a highly phosphorylated protein that ran at ∼50 kDa, most likely reflecting the chimeric receptor. Mutation of either of the Grb2/Grap binding sites minimally altered the overall phosphorylation of the BTLA cytoplasmic tail, suggesting that these residues contribute little to the total amount of phosphotyrosine molecules present on this receptor after pervanadate treatment. In contrast, mutation of the ITIM and to a greater extent the ITSM severely reduced the overall level of tyrosine phosphorylation of the BTLA cytoplasmic tail, indicating these residues are the major targets of protein kinases. These data, demonstrating a marked loss of 4G10 reactivity after mutation of Y282, confirm a previous finding in established T cell lines (10). SHP-1 and SHP-2 are recruited to the BTLA cytoplasmic tail in primary human T cells. A, Schematic representation of the mCD28/hBTLA cytoplasmic domain in which the identity and location of each phosphotyrosine motif is highlighted. B, CD4 T cells were transduced with lentiviral vectors expressing mCD28/hBTLA-WT and the indicated mutant cytoplasmic tails, expanded and rested down. Cells were treated with pervanadate, lysed, and immunoprecipitated using an anti-mCD28 Ab. Tyrosine-phosphorylated proteins were detected by probing with 4G10. The membrane was then stripped and reprobed with a SHP-2(p)-specific Ab (top) and subsequently with mCD28 Ab (bottom) to demonstrate equal loading. C, The same immunoprecipitates were rerun on a new gel, and SHP-1 recruitment was assessed by Western blotting with a SHP-1-specific Ab. The membrane was stripped and reprobed with mCD28 Ab to demonstrate equal loading. D, Transduced CD4 T cells were incubated with pervanadate, lysed and immunoprecipitated using mCD28 Ab. SHP-2(p) and SHP-1 recruitment was assessed by Western blot analysis with SHP-2(p)- and SHP-1-specific Ab. Equal loading was demonstrated by immunoblotting with mCD28 Ab. All data are representative for three independent experiments. In addition to the 50-kDa chimeric receptor, we observed one other 4G10 reactive complex that ran at ∼70 kDa. Because earlier studies indicated that both SHP-1 and SHP-2 bind the BTLA cytoplasmic tail (8, 10, 21), we reprobed these blots using SHP-1- and SHP-2-specific Abs and were able to confirm that SHP-1 and SHP-2 bind the BTLA cytoplasmic tail in primary human T cells (Fig. 3⇑, B and C). However, in contrast to previous reports using cell lines (21), we observed that mutation of the ITIM or ITSM clearly reduced but did not abrogate SHP-2 recruitment. Furthermore, mutation of both the ITIM and ITSM did not abrogate SHP-2 recruitment. Only when all four tyrosines were mutated did we observe no recruitment of SHP-2, indicating that the Grb2/Grap binding sites contribute to the ability of BTLA to recruit phosphatases (Fig. 3⇑D). We attempted to probe our mCD28/BTLA immunoprecipitates for Grb2/Grap binding site factors and did not detect any factors by Western blot (data not shown). Lastly, single point mutations within the ITIM and ITSM more severely affect SHP-1 rather than SHP-2 recruitment to the BTLA cytoplasmic tail (it should be noted that longer film exposures do reveal some pervanadate-dependent recruitment of SHP-1 to Y257F and Y282F BTLA cytoplasmic tails). These data suggest differences in the structural requirements required to recruit SHP-1 and SHP-2 to the BTLA cytoplasmic tail. The ITSM was initially described as a tyrosine-based sequence in the CD150 cytoplasmic tail interacting with the small adaptor protein SH2D1A (16). In the presence of this adaptor protein, CD150 associates with SHIP, and in the absence of SH2D1A the ITSM of CD150 “switches” and associates with SHP-2. Although primary human CD4 T cells express SH2D1A, we were unable to demonstrate SHIP recruitment to the BTLA-WT cytoplasmic tail (data not shown). To test the hypothesis that the inability of the BTLA to associate with SHIP might be due to the fact that BTLA cytoplasmic tail does not recruit SH2D1A, we transfected 293T cells with human flag-tagged epitope SH2D1A and SHIP and GST-CD150, mCD28/hBTLA-WT, or mCD28/hBTLA Y282F expression plasmids. Subsequently the cells were treated with pervanadate and lysed. We found a distinct association of CD150 with SHIP in the presence of SH2D1A after GST pull-down but no association of SHIP with BTLA regardless of the presence of SH2D1A (Fig. 4⇓A). Previously we demonstrated that SH2D1A did not associate with the PD-1 cytoplasmic tail, indicating that not all ITSM sequences interact with this adaptor. Next, we asked whether the BTLA cytoplasmic tail could recruit SH2D1A. Using the 293T cell transient transfection system previously described, we were able to show that SH2D1A was able to bind to CD150 but not the BTLA cytoplasmic tail (Fig. 4⇓B). This result further supports the notion that other sequences may be required to recruit SH2D1A to a cytoplasmic tail and further blurs the distinction between ITIMs and ITSMs. BTLA cytoplasmic tail does not recruit SHIP or SH2D1A. 293T cells were transiently transfected with mCD28/hBTLA, mCD28/hBTLA 282F, or GST-CD150 expression constructs in presence or absence of a SH2D1A expression construct. All cells were also cotransfected with a SHIP expression plasmid. At 48 h following transfection, cells were stimulated with pervanadate for 5 min. Cells were lysed, and GST-CD150 or mCD28/hBTLA was precipitated using glutathione-coupled agarose beads or anti-mCD28 Abs, respectively. A, Immunoprecipitates (IP) and whole cell lysates (WCL) were probed with SHIP Abs, as indicated. B, Immunoprecipitates and whole cell lysates were probed with anti-SH2D1A Abs, as indicated. The bottom gel shows equal loading of protein after stripping the immunoprecipitation membrane and reprobing with GST or mCD28, respectively. All data are representative for two independent experiments. All of the previous studies examining phosphatase recruitment to the BTLA cytoplasmic tails were done under conditions that prevented functional assays. We therefore wanted to establish a model in which we could measure recruitment of factors to the BTLA cytoplasmic tail using stimuli that also allowed us to measure BTLA function. Previously, we demonstrated that CD3/CD28 and CD3/ICOS artificial APCs could be used both to stimulate T cells as well as to pull-down PI3K enzymatic activity associated with the respective costimulatory molecule after engagement (28). In Fig. 1⇑, we demonstrated that CD3/28/mCD28-coated beads were able to engage mCD28-BTLA-WT-transduced cells and prevent cell expansion and cytokine production. Thus, we asked whether CD3/h28/mCD28 coated beads could both serve as artificial APCs and as an agent to pull-down complexes associating with the BTLA cytoplasmic tail. We transduced the same mutant BTLA constructs described in Fig. 3⇑ into primary human CD4 T cells, and these cells were expanded and allowed to return to a near resting cell volume. The transduced cells were stimulated with CD3/28/mCD28-coated beads for 7 min and lysed. The magnetic beads were used to isolate the complexes bound, and immunoblotting for mCD28, hCD28, SHP-1, and SHP-2 was performed. Because previous groups have demonstrated that CD3 and CD28 engagement can recruit SHP family members (39, 40, 41), we used CD3/28/MHC-I coated beads as a control so that a comparison of the complexes recruited by CD3/28/MHC-I and CD3/28/mCD28 reveals the ability of the various BTLA cytoplasmic tails to recruit SHP-1 and SHP-2. As expected, we observed no differences in the ability of CD3/28/MHC-I-coated and CD3/28/mCD28-coated beads to recruit and precipitate SHP-1 complexes in cells transduced with GFP (Fig. 5⇓). In cells transduced with the mCD28-BTLA-WT construct, we observed increased SHP-1 recruitment after CD3/h28/mCD28 stimulation and immunoprecipitation, indicating that SHP-1 is recruited to the BTLA cytoplasmic tail. As controls, we probed for mCD28 to compare the amount of mCD28 BTLA immunoprecipitated between the different transduced cell populations and for hCD28 to compare complexes pulled down within a transduced population after CD3/28/MHC-I and CD3/28/mCD28 stimulation. Artificial APC stimulation reveals SHP-1 but no SHP-2 recruitment to the BTLA cytoplasmic tail in an ITSM-dependent manner. CD4 T cells were transduced with lentiviral vectors expressing GFP, mCD28/hBTLA-WT, or the indicated mutant chimeric receptor (or mutation of all four tyrosines). After expansion, the cells were restimulated with either CD3/28/MHC-I or CD3/28/mCD28, lysed, and the complexes binding to the beads were isolated. Immunoblotting was performed for SHP-1, SHP-2(p), mCD28, and hCD28. A whole cell lysate (WCL) of GFP-transduced cells was included as positive control for protein detection. Data are representative of two independent experiments. Unlike the data obtained using pervanadate treatment (Fig. 3⇑), we observed that the Y282F mutation was able to block SHP-1 recruitment. Thus, using pervanadate treatment, mutation to all four tyrosines was required to ablate SHP recruitment, whereas using artificial APCs, only a single mutation was required. Perhaps more surprising is that we were unable to detect significant SHP-2 recruitment to the intact BTLA cytoplasmic tail. Again, this result is in stark contrast to the results obtained using pervanadate-treated cells. To rule out technical issues that may preclude SHP-2 from binding under these experimental conditions, we performed similar experiments using the PD-1 cytoplasmic tail (17) and found that we could recruit SHP-2 to the PD-1 cytoplasmic tail (data not shown). These data show that the BTLA cytoplasm recruits a distinct set of signaling proteins upon pervanadate treatment and receptor engagement. To measure the ability of the various BTLA cytoplasmic tail mutations to block T cell activation, we transduced primary CD4 T cells with mCD28/hBTLA-WT chimeric receptor or chimeric receptors containing a single tyrosine to phenylalanine mutations in the BTLA cytoplasmic tail. As shown in Fig. 6⇓A, all cell populations expressed similarly high levels of mCD28, allowing a direct comparison between the BTLA-WT and each of the mutant constructs. After transduction the cells were expanded and allowed to return to a near resting cell volume. Subsequently, the cells were left alone or restimulated with CD3/h28/MHC-I- or CD3/h28/mCD28-coated beads. First, we measured the ability of each of these artificial APCs to augment IL-2 production. None of the single point mutations altered the ability of BTLA signaling to suppress CD3/CD28-mediated IL-2 production (Fig. 6⇓B). Likewise, none of the mutations interfered with ability of BTLA to suppress T cell expansion (Fig. 6⇓C). Thus, unlike the PD-1 cytoplasmic tail in which a single mutation disrupted PD-1 function (17, 18), no single mutation could disrupt the function of BTLA cytoplasmic tail. Importantly, under the same stimulation conditions, mutation of the BTLA ITSM (Y282F) interfered with SHP-1 recruitment. Thus, SHP-1 recruitment does not correlate with BTLA function. Moreover because we did not observe SHP-2 recruitment at all, the role the SHPs play in BTLA function is unclear. Single tyrosine mutant constructs of the mCD28/hBTLA cytoplasmic tail fail to inhibit T cell proliferation and IL-2 expression. CD4 T cells were transduced with lentiviral vectors expressing either mCD28/hBTLA-WT or the indicated mutant chimeric receptor. A, Expression of the different constructs was assessed by flow cytometry using a mCD28-specific Ab 3 days after transduction. B, Cells were allowed to expand and rest down before stimulated with the indicated artificial APCs. IL-2 expression was measured by quantitative RT-PCR 24 h after stimulation and expressed as fold induction over unstimulated cells. C, T cell expansion was measured by cell counting on the indicated days. Artificial APCs used to stimulate each transduced population are indicated (inset) for the growth curves. All data are representative of three independent experiments. Next, we introduced BTLA cytoplasmic tails with multiple mutations to determine how many mutations were required to make the BTLA cytoplasmic tail nonfunctional. As with the single BTLA cytoplasmic tail mutants we observed high expression of all constructs (Fig. 7⇓A). Surprisingly, mutation of both the ITIM and ITSM did not render the BTLA cytoplasmic tail nonfunctional, suggesting that the Grb2/Grap binding sites play an important role in mediating BTLA function. Even a BTLA cytoplasmic tail with only one intact YXN motif retained a significant ability to block T cell activation. Only when all four tyrosines were mutated did the BTLA cytoplasmic tail lose its ability to inhibit T cell activation. These results demonstrate that the signaling molecules recruited to the BTLA cytoplasmic tail require at least one phosphotyrosine to assemble (Fig. 7⇓, B and C). Signals to inhibit T cell activation can be initiated by multiple phosphotyrosine motifs within the BTLA cytoplasmic tail. CD4 T cells were transduced with lentiviral vectors expressing either mCD28/hBTLA-WT or the indicated mutant chimeric receptor (including all four mutated tyrosines). A, Expression of the different constructs was assessed by flow cytometry using a mCD28-specific Ab 3 days after transduction. B, Cells were allowed to expand and rest down before being stimulated with the indicated artificial APCs. IL-2 expression was measured by quantitative RT-PCR 24 h after stimulation and expressed as fold induction over unstimulated cells. C, T cell expansion was measured by cell counting on the indicated days. Artificial APCs used to stimulate each transduced population are indicated (inset) for growth curves. All data are representative of three independent experiments. Members of the CD28 family play a crucial role in determining whether a T cell becomes activated after Ag engagement. Upon ligation, their cytoplasmic tails become phosphorylated and phosphotyrosine motifs recruit signaling molecules that either promote or repress T cell activation. Much effort has been devoted to understanding which signaling molecules are recruited to individual phosphotyrosine motifs and how this recruitment affects T cell activation (42, 43, 44, 45, 46, 47). However, to date, no clear consensus has emerged. Part of this confusion, at least for the more senior members of this family, CD28 and CTLA-4, is the result of using transformed T cell lines to study CD28 family function. Previously, we have shown using DNA microarrays that Jurkat T cells are largely insensitive to the effects of the CD28 costimulation, suggesting that key signaling molecules involved in CD28 signal transduction are missing or constitutively active (34). Use of established T cell lines to study negative regulators of T cell activation is even more problematic as during the transformation process, these cells inactivate molecules that limit cell proliferation (48, 49). For these reasons we have chosen to study BTLA signal transduction in primary human T cells. The clear advantage of this system is that primary cells have the full complement of signal transducing molecules and are highly sensitive to cell cycle control and glucose availability (32). Recently, agonist BTLA Abs have been described that potently suppress T cell activation in primary murine CD4 T cells (50), suggesting that the difference between our study and Watanabe et al. (10) reflect a difference between primary and transformed cell lines rather than species-specific differences. Moreover, using lentivirally transduced cells, we are able to correlate alterations in the BTLA cytoplasmic tail with the ability of the receptor to block T cell activation, permitting a structure-function analysis in primary human T cells. The reductionist approach we undertook, using Ab to engage specific receptors while having the advantage of studying BTLA signal transduction in isolation, also carries the caveat that Ab and natural ligands have different affinities for receptors perhaps leading to distinct functional outcomes. Studies that compared signal transduction pathways initiated by anti-CD28 Ab and natural ligand found a great deal of concordance between these two stimuli (46). Now that the true ligand of BTLA has been identified as HVEM (12, 13), it may be possible in future studies to examine the effects of BTLA signal transduction using its natural ligand to engage BTLA. However, HVEM binds the costimulatory molecule LIGHT, a lymphotoxin α (51), and perhaps other T cell receptors, making such an approach difficult to isolate the effects of BTLA signal transduction. Many conclusions of our work were not consistent with those obtained using human and murine transformed cell lines. We found that BTLA triggering provided a potent signal to block T cell activation that strongly inhibited CD3/CD28-mediated up-regulation of IL-2. This is in contrast to the 2-fold differences observed using cell line models (10). The potency by which BTLA blocks T cell activation is on par with that of PD-1 because we previously observed a similar level of suppression engaging a mCD28-hPD-1 chimeric receptor with CD3/h28/mCD28 artificial APCs (17). This observation suggests that BTLA has the same potential to prevent autoimmunity and to be usurped by tumor cells as a means to escape the immune response as PD-1 (52, 53, 54, 55). Additionally, although all studies to date show an association of SHP-1 and SHP-2 with the BTLA cytoplasmic tail (8, 10, 21), the structural requirements within the BTLA cytoplasmic tail required to recruit these phosphatases and the functional consequences of this binding differed considerably between primary and transformed cell lines. Gavrieli et al. (21) found that upon pervanadate treatment or cross-linking of myc-tagged DO11.1 hybridoma cells mutation of either the ITIM or ITSM completely disrupted BTLA’s ability to recruit SHP-1 and SHP-2, whereas mutation of the single conserved Grb2/Grap site had no effect. We found that mutation of either ITIM or ITSM reduced but did not abrogate SHP-1 and SHP-2 recruitment upon pervanadate treatment. More importantly, upon stimulation with CD3/h28/mCD28 coated beads, we were able to detect SHP-1 but not SHP-2 recruitment. In similar “artificial APC pull-down” studies using the PD-1 cytoplasmic tail, we were able to detect SHP-2 recruitment consistent with our pervanadate studies (17) (A. R. Lanfranco and J. L. Riley, unpublished observations), suggesting that the differences in our ability to detect SHP-1 and SHP-2 between pervanadate and artificial APC-stimulated cells is not due to differences in the experimental protocol. Moreover, mutations that disrupted SHP-1 recruitment had no effect on the ability of BTLA to function as a negative regulator of T cell activation. Interestingly, a BTLA cytoplasmic tail, which had its ITIM, ITSM, and one of its Grb2/Grap sites mutated, retained most of its ability to block T cell activation, despite the lack of SHP-1 and SHP-2 recruitment. There are several interpretations to this data. First, it could mean that Grb2/Grap binding sites recruit another signaling molecule that inhibits T cell activation. Because we detected no other phosphotyrosine complexes in our BTLA immunoprecipitation studies using pervanadate-treated CD4 T cells, this molecule would likely either have to run as a 70-kDa protein or not get tyrosine phosphorylated upon binding the BTLA cytoplasmic tail. Alternatively, Grb2/Grap binding proteins could recruit SHP family members independently of the ITIM and ITSM. If this explanation is true, it would suggest that undetectable levels of SHP family members are able to block T cell activation. Currently, little is known about which factors bind to these YXN motifs found in the BTLA cytoplasmic tail. CD22 is another molecule that contains an assortment of ITIMs and Grb2/Grap binding sites in its cytoplasmic tail. However, because CD22 recruits Grb2 whereas BTLA does not (21) (J. M. Chemnitz, A. R. Lanfranco, and J. L. Riley, unpublished observations) and because the association of CD22 with Grb2 is thought to initiate a signal transduction that promotes cell proliferation (22), lessons learned in one molecule may not be applicable to the other. Our structure-function analysis of the BTLA cytoplasmic tail in primary human CD4 T cells also revealed differences in structural requirements for SHP-1 and SHP-2 recruitment, and more importantly, marked differences between artificial APC activation of cells and pervanadate treatment. Mutation of either the ITIM or ITSM resulted in a more severe reduction of SHP-1 recruitment after pervanadate treatment compared with SHP-2. This result is unlikely to be due to technical differences in the ability to detect SHP-1 vs SHP-2 as we actually observe higher levels of SHP-1 than SHP-2 binding to the BTLA-WT cytoplasmic tail (Fig. 3⇑). Although the domains within SHP-1 and SHP-2 that confer binding to phosphotyrosine motifs are highly conserved, differences in the ability of SHP-1 and SHP-2 to bind various cytoplasmic tails have been noted (14, 56, 57). Our studies support the findings of these earlier reports in that they noted that structural requirements to recruit SHP-1 were more stringent than requirement to recruit SHP-2. Moreover, these data would seem to suggest that SHP-2 rather than SHP-1 mediates the blockade of T cell activation by BTLA-mediated signal transduction because constructs that do not appear to recruit SHP-1 still inhibit T cell activation. However, we cannot formally rule out that the SHP-1 recruitment at or below the level of detection of our immunoprecipitation experiments mediates the effects of BTLA engagement. Interestingly, when the N-terminal ITIM of KIR2DL1 was placed in isolation, it was able to recruit SHP-2 but not SHP-1 and retained its ability to limit cell activation (57), providing another example of a receptor that is unable to recruit SHP-1 but still is able to act as a negative regulator of cell activation. More interesting, however, were the differential effects of pervanadate treatment and artificial APC stimulation. Several studies have noted differences between TCR engagement and pervanadate stimulation (58, 59, 60). Other studies have noted that using pervanadate to recruit factors did not correlate with function of the killer cell Ig-like receptors (KIRs) (61). Our results were quite perplexing. With pervanadate treatment, it appeared that SHP-2 binding was able to correlate with function because all mutants except the one lacking all tyrosines was able to recruit detectable levels of SHP-2. Thus, these data alone suggest that SHP-2 is the main mediator of BTLA’s suppressive effects. However, when we performed immunoprecipitations with the same reagents used to activate the T cells, we obtained significantly different results. We were no longer able to detect SHP-2 recruitment, and SHP-1 recruitment was disrupted by a single mutation to the BTLA ITSM. Thus, we were unable to detect any signaling protein in which recruitment to the BTLA cytoplasmic tail correlated with function. What factors do mediate this suppression remain an outstanding question. BTLA was originally introduced as a member of the CD28 family because it contained an IgV-like domain and appeared to bind a B7 family member (2, 10). However, in light of the discovery that the true ligand of BTLA is the TNF family member HVEM (12) and because of the structure-function research presented in our study, we believe that an argument can be made that BTLA (as well as the similarly structured PD-1) are more likely to be members of the KIRs rather than CD28 family. As opposed to the CD28 family, the KIR family appears to be a recent addition to the immune system and has evolved rapidly in primates. A comparison between all of the members of the CD28 family revealed that the amino acid sequence of BTLA, followed closely by PD-1, has evolved the most during the transition from mouse to human (4). Notably, hBTLA has acquired an additional Grb2/Grap binding site that based on our data may make the human version of BTLA a more effective inhibitor of T cell activation than the murine version. Thus, like the KIR family, BTLA and PD-1 are still developing their niche in the immune system. Additionally, like BTLA and PD-1, all members of the KIR family contain an Ig extracellular domain coupled to a series of ITIMs and ITSMs that are usually spaced ∼20 aa apart (62). These receptors recruit phosphatases SHP-1, SHP-2, SHIP-1, and SHIP-2 (62, 63). Although we have not detected SHIP family recruitment to either PD-1 or BTLA, we and others have detected SHP-1 and SHP-2 binding. In contrast, CTLA-4 does not contain a conventional ITIM and, although some reports have indicated an association of either SHP-1 or SHP-2, attempts to correlate SHP family binding with CTLA-4 function have not proved successful (64, 65, 66, 67, 68, 69, 70, 71). The inability of PD-1 and BTLA to bind the SHIP family is likely due to the inability of PD-1 and BTLA cytoplasmic tails to recruit SH2D1A. Understanding how this motif is distinct from the ITIM, and more importantly the molecular mechanisms by which these receptors block T cell activation, will contribute greatly in the final determination of which family these receptors belong and how they regulate T cell activation. We thank Goro Osawa, Stephen Stoltzfus, and the University of Pennsylvania Center for AIDS Research Immunology Core for purifying primary human T cells. We also thank Dr. Kim Nichols for advice related to the SH2D1A experiments and the other members of the laboratory for support and encouragement. ↵1 This work was supported by Grant AI 057838 from the National Institutes of Health (to J.L.R.). This work is also supported by a grant from the Mildred Scheel Stiftung der Deutschen Krebshilfe (to J.M.C.). ↵3 Abbreviations used in this paper: PD-1, programmed death-1; BTLA, B and T lymphocyte attenuator; hBTLA, human BTLA; SH, Src homology; SHP, Src homology protein; HVEM, herpes virus entry mediator; mCD28, murine CD28; hCD28, human CD28; Grap, Grb2-related adaptor protein; KIR, killer cell Ig-like receptor; WT, wild type; ITSM, immunoreceptor tyrosine-based switch motif. Carreno, B. M., M. Collins. 2002. The B7 family of ligands and its receptors: new pathways for costimulation and inhibition of immune responses. Annu. Rev. Immunol. 20: 29-53. Carreno, B. M., M. Collins. 2003. BTLA: a new inhibitory receptor with a B7-like ligand. Trends Immunol. 24: 524-527. Coyle, A. J., J.-C. Gutierrez-Ramos. 2001. The expanding B7 superfamily: increasing complexity in costimulatory signals regulating T cell function. Nat. Immunol. 2: 203-209. Riley, J. L., C. H. June. 2005. The CD28 family: a T cell rheostat for therapeutic control of T cell activation. Blood 105: 13-21. Greenwald, R. J., G. J. Freeman, A. H. Sharpe. 2005. The B7 family revisited. Annu. Rev. Immunol. 23: 515-548. Croft, M.. 2005. The evolving crosstalk between co-stimulatory and co-inhibitory receptors: HVEM-BTLA. Trends Immunol. 26: 292-294. Yang, J., H. Zhu, T. L. Murphy, W. Ouyang, K. M. Murphy. 2001. IL-18-stimulated GADD45β required in cytokine-induced, but not TCR-induced, IFN-γ production. Nat. Immunol. 2: 157-164. Han, P., O. D. Goularte, K. Rufner, B. Wilkinson, J. Kaye. 2004. An inhibitory Ig superfamily protein expressed by lymphocytes and APCs is also an early marker of thymocyte positive selection. J. Immunol. 172: 5931-5939. Tao, R., L. Wang, R. Han, T. Wang, Q. Ye, T. Honjo, T. L. Murphy, K. M. Murphy, W. W. Hancock. 2005. Differential effects of B and T lymphocyte attenuator and programmed death-1 on acceptance of partially versus fully MHC-mismatched cardiac allografts. J. Immunol. 175: 5774-5782. Watanabe, N., M. Gavrieli, J. R. Sedy, J. Yang, F. Fallarino, S. K. Loftin, M. A. Hurchla, N. Zimmerman, J. Sim, X. Zang, et al 2003. BTLA is a lymphocyte inhibitory receptor with similarities to CTLA-4 and PD-1. Nat. Immunol. 4: 670-679. Zang, X., P. Loke, J. Kim, K. Murphy, R. Waitz, J. P. Allison. 2003. B7x: a widely expressed B7 family member that inhibits T cell activation. Proc. Natl. Acad. Sci. USA 100: 10388-10392. Sedy, J. R., M. Gavrieli, K. G. Potter, M. A. Hurchla, R. C. Lindsley, K. Hildner, S. Scheu, K. Pfeffer, C. F. Ware, T. L. Murphy, K. M. Murphy. 2004. B and T lymphocyte attenuator regulates T cell activation through interaction with herpesvirus entry mediator. Nat. Immunol. 6: 90-98. Gonzalez, L. C., K. M. Loyet, J. Calemine-Fenaux, V. Chauhan, B. Wranik, W. Ouyang, D. L. Eaton. 2005. A coreceptor interaction between the CD28 and TNF receptor family members B and T lymphocyte attenuator and herpesvirus entry mediator. Proc. Natl. Acad. Sci. USA 102: 1116-1121. Burshtyn, D. N., W. Yang, T. Yi, E. O. Long. 1997. A novel phosphotyrosine motif with a critical amino acid at position −2 for the SH2 domain-mediated activation of the tyrosine phosphatase SHP-1. J. Biol. Chem. 272: 13066-13072. Shlapatska, L. M., S. V. Mikhalap, A. G. Berdova, O. M. Zelensky, T. J. Yun, K. E. Nichols, E. A. Clark, S. P. Sidorenko. 2001. CD150 association with either the SH2-containing inositol phosphatase or the SH2-containing protein tyrosine phosphatase is regulated by the adaptor protein SH2D1A. J. Immunol. 166: 5480-5487. Chemnitz, J. M., R. V. Parry, K. E. Nichols, C. H. June, J. L. Riley. 2004. SHP-1 and SHP-2 associate with immunoreceptor tyrosine-based switch motif of programmed death 1 upon primary human T cell stimulation, but only receptor ligation prevents T cell activation. J. Immunol. 173: 945-954. Okazaki, T., A. Maeda, H. Nishimura, T. Kurosaki, T. Honjo. 2001. PD-1 immunoreceptor inhibits B cell receptor-mediated signaling by recruiting Src homology 2-domain-containing tyrosine phosphatase 2 to phosphotyrosine. Proc. Natl. Acad. Sci. USA 98: 13866-13871. Jackson, D. E., K. R. Kupcho, P. J. Newman. 1997. Characterization of phosphotyrosine binding motifs in the cytoplasmic domain of platelet/endothelial cell adhesion molecule-1 (PECAM-1) that are required for the cellular association and activation of the protein-tyrosine phosphatase, SHP-2. J. Biol. Chem. 272: 24868-24875. Rönnstrand, L., A.-K. Arvidsson, A. Kallin, C. Rorsman, U. Hellman, U. Engström, C. Wernstedt, C.-H. Heldin. 1999. SHP-2 binds to Tyr763 and Tyr1009 in the PDGF β-receptor and mediates PDGF-induced activation of the Ras/MAP kinase pathway and chemotaxis. Oncogene 18: 3696-3702. Gavrieli, M., N. Watanabe, S. K. Loftin, T. L. Murphy, K. M. Murphy. 2003. Characterization of phosphotyrosine binding motifs in the cytoplasmic domain of B and T lymphocyte attenuator required for association with protein tyrosine phosphatases SHP-1 and SHP-2. Biochem. Biophys. Res. Commun. 312: 1236-1243. Otipoby, K. L., K. E. Draves, E. A. Clark. 2001. CD22 regulates B cell receptor-mediated signals via two domains that independently recruit Grb2 and SHP-1. J. Biol. Chem. 276: 44315-44322. Pfrepper, K. I., A. Marie-Cardine, L. Simeoni, Y. Kuramitsu, A. Leo, J. Spicka, I. Hilgert, J. Scherer, B. Schraven. 2001. Structural and functional dissection of the cytoplasmic domain of the transmembrane adaptor protein SIT (SHP2-interacting transmembrane adaptor protein). Eur. J. Immunol. 31: 1825-1836. Wu, Y., M. J. Nadler, L. A. Brennan, G. D. Gish, J. F. Timms, N. Fusaki, J. Jongstra-Bilen, N. Tada, T. Pawson, J. Wither, et al 1998. The B-cell transmembrane protein CD72 binds to and is an in vivo substrate of the protein tyrosine phosphatase SHP-1. Curr. Biol. 8: 1009-1017. Riley, J. L., P. J. Blair, J. T. Musser, R. Abe, K. Tezuka, T. Tsuji, C. H. June. 2001. ICOS costimulation requires IL-2 and can be prevented by CTLA-4 engagement. J. Immunol. 166: 4943-4948. Hansen, J. A., P. J. Martin, R. C. Nowinski. 1980. Monoclonal-antibodies identifying a novel T-cell antigen and Ia antigens of human-lymphocytes. Immunogenetics 10: 247-260. Thomas, A. K., M. V. Maus, W. S. Shalaby, C. H. June, J. L. Riley. 2002. A cell-based artificial antigen-presenting cell coated with anti-CD3 and CD28 antibodies enables rapid expansion and long-term growth of CD4 T lymphocytes. Clin. Immunol. 105: 259-272. Parry, R. V., C. A. Rumbley, L. H. Vandenberghe, C. H. June, J. L. Riley. 2003. CD28 and inducible costimulatory protein Src homology 2 binding domains show distinct regulation of phosphatidylinositol 3-kinase, Bcl-xL, and IL-2 expression in primary human CD4 T lymphocytes. J. Immunol. 171: 166-174. Wang, J., M. F. Wilkinson. 2000. Site-directed mutagenesis of large (13-kb) plasmids in a single-PCR procedure. BioTechniques 29: 976-978. Parry, R. V., K. Reif, G. Smith, D. M. Sansom, B. A. Hemmings, S. G. Ward. 1997. Ligation of the T cell co-stimulatory receptor CD28 activates the serine-threonine protein kinase protein kinase B. Eur. J. Immunol. 27: 2495-2501. Lewis, J., L. J. Eiben, D. L. Nelson, J. I. Cohen, K. E. Nichols, H. D. Ochs, L. D. Notarangelo, C. S. Duckett. 2001. Distinct interactions of the X-linked lymphoproliferative syndrome gene product SAP with cytoplasmic domains of members of the CD2 receptor family. Clin. Immunol. 100: 15-23. Zhang, X., J. C. Schwartz, X. Guo, S. Bhatia, E. Cao, L. Chen, Z. Y. Zhang, M. A. Edidin, S. G. Nathenson, S. C. Almo. 2004. Structural and functional analysis of the costimulatory receptor programmed death-1. Immunity 20: 337-347. Compaan, D. M., L. C. Gonzalez, I. Tom, K. M. Loyet, D. Eaton, S. G. Hymowitz. 2005. Attenuating lymphocyte activity: the crystal structure of the BTLA-HVEM complex. J. Biol. Chem. 280: 39553-39561. Hurchla, M. A., J. R. Sedy, M. Gavrielli, C. G. Drake, T. L. Murphy, K. M. Murphy. 2005. B and T lymphocyte attenuator exhibits structural and expression polymorphisms and is highly induced in anergic CD4+ T cells. J. Immunol. 174: 3377-3385. Schwartz, J. C. D., X. Zhang, A. A. Fedorov, S. G. Nathenson, S. C. Almo. 2001. Structural basis for co-stimulation by the human CTLA-4/B7-2 complex. Nature 410: 604-608. Gu, H., J. C. Pratt, S. J. Burakoff, B. G. Neel. 1998. Cloning of p97/Gab2, the major SHP2-binding protein in hematopoietic cells, reveals a novel pathway for cytokine-induced gene activation. Mol. Cell 2: 729-740. Nishida, K., Y. Yoshida, M. Itoh, T. Fukada, T. Ohtani, T. Shirogane, T. Atsumi, M. Takahashi-Tezuka, K. Ishihara, M. Hibi, T. Hirano. 1999. Gab-family adapter proteins act downstream of cytokine and growth factor receptors and T- and B-cell antigen receptors. Blood 93: 1809-1816. Parry, R. V., G. C. Whittaker, M. Sims, C. E. Edmead, M. J. Welham, S. G. Ward. 2006. Ligation of CD28 stimulates the formation of a multimeric signaling complex involving grb-2-associated binder 2 (gab2), Src homology phosphatase-2, and phosphatidylinositol 3-kinase: evidence that negative regulation of CD28 signaling requires the gab2 pleckstrin homology domain. J. Immunol. 176: 594-602. Rudd, C. E., H. Schneider. 2003. Unifying concepts in CD28, ICOS and CTLA4 co-receptor signalling. Nat. Rev. Immunol. 3: 544-556. Acuto, O., F. Michel. 2003. CD28-mediated co-stimulation: a quantitative support for TCR signalling. Nat. Rev. Immunol. 3: 939-951. Kane, L. P., A. Weiss. 2003. The PI-3 kinase/Akt pathway and T cell activation: pleiotropic pathways downstream of PIP3. Immunol. Rev. 192: 7-20. Frauwirth, K. A., C. B. Thompson. 2002. Activation and inhibition of lymphocytes by costimulation. J. Clin. Invest. 109: 295-299. Ward, S. G.. 1996. CD28: a signalling perspective. Biochem. J. 318: (Pt. 2):361-377. June, C. H., J. A. Bluestone, L. M. Nadler, C. B. Thompson. 1994. The B7 and CD28 receptor families. Immunol. Today 15: 321-331. Shan, X., M. J. Czar, S. C. Bunnell, P. Liu, Y. Liu, P. L. Schwartzberg, R. L. Wange. 2000. Deficiency of PTEN in Jurkat T cells causes constitutive localization of Itk to the plasma membrane and hyperresponsiveness to CD3 stimulation. Mol. Cell. Biol. 20: 6945-6957. Astoul, E., C. Edmunds, D. A. Cantrell, S. G. Ward. 2001. PI 3-K and T-cell activation: limitations of T-leukemic cell lines as signaling models. Trends Immunol. 22: 490-496. Krieg, C., P. Han, R. Stone, O. D. Goularte, J. Kaye. 2005. Functional analysis of B and T lymphocyte attenuator engagement on CD4+ and CD8+ T cells. J. Immunol. 175: 6420-6427. Mauri, D. N., R. Ebner, R. I. Montgomery, K. D. Kochel, T. C. Cheung, G. L. Yu, S. Ruben, M. Murphy, R. J. Eisenberg, G. H. Cohen, et al 1998. LIGHT, a new member of the TNF superfamily, and lymphotoxin α are ligands for herpesvirus entry mediator. Immunity 8: 21-30. Iwai, Y., M. Ishida, Y. Tanaka, T. Okazaki, T. Honjo, N. Minato. 2002. Involvement of PD-L1 on tumor cells in the escape from host immune system and tumor immunotherapy by PD-L1 blockade. Proc. Natl. Acad. Sci. USA 99: 12293-12297. Dong, H., S. E. Strome, D. R. Salomao, H. Tamura, F. Hirano, D. B. Flies, P. C. Roche, J. Lu, G. Zhu, K. Tamada, et al 2002. Tumor-associated B7–H1 promotes T-cell apoptosis: a potential mechanism of immune evasion. Nat. Med. 8: 793-800. Philosof-Oppenheimer, R., C. S. Hampe, K. Schlessinger, M. Fridkin, I. Pecht. 2000. An immunoreceptor tyrosine-based inhibitory motif, with serine at site Y-2, binds SH2-domain-containing phosphatases. Eur. J. Biochem. 267: 703-711. Bruhns, P., P. Marchetti, W. H. Fridman, E. Vivier, M. Daeron. 1999. Differential roles of N- and C-terminal immunoreceptor tyrosine-based inhibition motifs during inhibition of cell activation by killer cell inhibitory receptors. J. Immunol. 162: 3168-3175. Griffith, C. E., W. Zhang, R. L. Wange. 1998. Zap-70-dependent and -independent activation of Erk in Jurkat T cells: differences in signaling induced by H2O2 and CD3 cross-linking. J. Biol. Chem. 273: 10771-10776. O’Shea, J. J., D. W. McVicar, T. L. Bailey, C. Burns, M. J. Smyth. 1992. Activation of human peripheral blood T lymphocytes by pharmacological induction of protein-tyrosine phosphorylation. Proc. Natl. Acad. Sci. USA 89: 10306-10310. Donovan, J. A., R. L. Wange, W. Y. Langdon, L. E. Samelson. 1994. The protein product of the c-cbl protooncogene is the 120-kDa tyrosine-phosphorylated protein in Jurkat cells activated via the T cell antigen receptor. J. Biol. Chem. 269: 22921-22924. Burshtyn, D. N., A. S. Lam, M. Weston, N. Gupta, P. A. Warmerdam, E. O. Long. 1999. Conserved residues amino-terminal of cytoplasmic tyrosines contribute to the SHP-1-mediated inhibitory function of killer cell Ig-like receptors. J. Immunol. 162: 897-902. Schneider, H., C. E. Rudd. 2000. Tyrosine phosphatase SHP-2 binding to CTLA-4: absence of direct YVKM/YFIP motif recognition. Biochem. Biophys. Res. Commun. 269: 279-283. Zhang, J., A. K. Somani, D. Yuen, Y. Yang, P. E. Love, K. A. Siminovitch. 1999. Involvement of the SHP-1 tyrosine phosphatase in regulation of T cell selection. J. Immunol. 163: 3012-3021. Chambers, C. A., J. P. Allison. 1996. The role of tyrosine phosphorylation and PTP-1C in CTLA-4 signal transduction. Eur. J. Immunol. 26: 3224-3229. Guntermann, C., D. R. Alexander. 2002. CTLA-4 suppresses proximal TCR signaling in resting human CD4+ T cells by inhibiting Zap-70 Tyr319 phosphorylation: a potential role for tyrosine phosphatases. J. Immunol. 168: 4420-4429. Schneider, H., D. S. da Rocha, H. Hu, C. E. Rudd. 2001. A regulatory role for cytoplasmic YVKM motif in CTLA-4 inhibition of TCR signaling. Eur. J. Immunol. 31: 2042-2050. Marengère, L. E., P. Waterhouse, G. S. Duncan, H. W. Mittrücker, G. S. Feng, T. W. Mak. 1996. Regulation of T cell receptor signaling by tyrosine phosphatase SYP association with CTLA-4. Science 272: 1170-1173. Nakaseko, C., S. Miyatake, T. Iida, S. Hara, R. Abe, H. Ohno, Y. Saito, T. Saito. 1999. Cytotoxic T lymphocyte antigen 4 (CTLA-4) engagement delivers an inhibitory signal through the membrane-proximal region in the absence of the tyrosine motif in the cytoplasmic tail. J. Exp. Med. 190: 765-774.